I can’t remember the context (or exact phrasing) of this statement, but the sentiment has stuck with me. I heard it on a recent episode of the podcast “On Being.” It was a conversation that included Parker Palmer, who is a well known author in Quaker circles. Palmer often writes about our innate wholeness, and I love that he used the breath to illustrate his point. The statement, as Palmer well knows, is absurd. Which side of the breath we will utilize isn’t something we get to choose. We need both the inhale and the exhale in order for our breath to be complete (and we need our breath to be complete in order to remain alive, so…). It’s obvious that we need both sides of the breath. But are there less obvious ‘opposites’ in our life? Are there opposites that we’ve convinced ourselves we have a choice in, but in actuality need both sides? 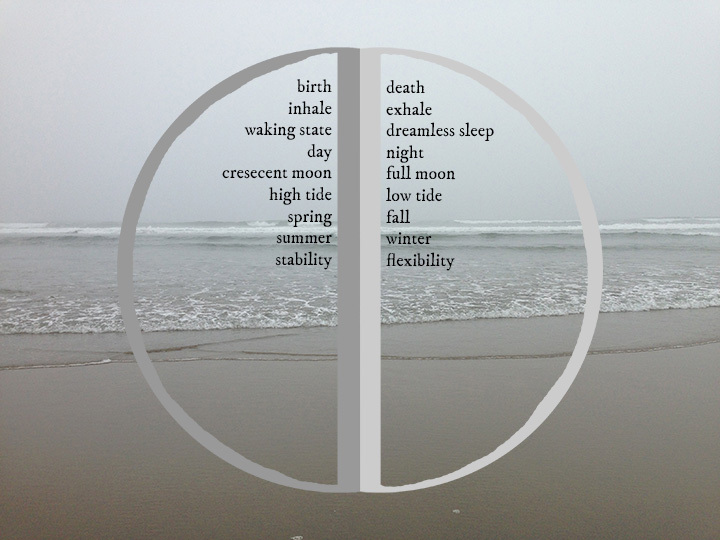 How many opposites make up our wholeness? The inhale and exhale, of course. But also our birth and death. And the state of wakefulness vs the state of dreamless sleep. I’ve recently been challenged by the notion—found in the Isha Upanishad—of needing both ignorance (avidya) and knowledge (vidya) for true spiritual freedom. This upanishad makes the claim that ultimate reality is the sum and the parts. It is the complete whole of everything, but also, each individual manifestation. Unity is the eternal and fundamental fact, without which all multiplicity would be unreal and an impossible illusion. The consciousness of Unity is therefore called Vidya, the Knowledge. Multiplicity is the play or varied self-expansion of the One, shifting in its terms, divisible in its view of itself, by force of which the One occupies many centers of consciousness, inhabits many formations of energy in the universal Movement. Multiplicity is implicit or explicit in unity. Without it the Unity would be either a void of non-existence or a powerless, sterile limitation to the state of indiscriminate self-absorption or of blank repose. In other words, without the underlying whole, our changing reality (the world we live in) would be unreal. And without changing reality, the underlying whole would be a void of nothing. We need both in order to experience and understand existence. God (or ultimate reality) can seamlessly experience both. In some mysterious fashion, ultimate reality can experience both the underlying whole and the changing reality all at once without any disturbance. We, however, get lost. We can’t see the Unity within the Multiplicity. We move through life thinking that the changing reality is all there is and we become bound by this belief. This is our ignorance (avidya). This is the veil of unknowing that keeps us from truly seeing the innate wholeness of Life.We practice yoga in order to clear this veil. We practice in order to remember our True Nature—the part of us that can freely move through life with an awareness of both our changing reality and the underlying wholeness to which everything belongs. I’ve been confused by the idea of needing avidya (ignorance). But in my study of this scripture, I’m coming to understand that it’s not saying we need ignorance and/or knowledge. It’s saying that we can’t get lost in any one aspect of being. We can’t lose our identity solely in the Unity or the Multiplicity. We must understand that both are part of us. We can’t deny or try to escape the changing reality we live in, but we can’t forget the underlying wholeness that makes it possible. In order to live in spiritual freedom we must accept and transcend both aspects of ultimate reality—both aspects of ourselves. Into a blind darkness enter they who follow after the Ignorance. Into a greater darkness they who devote themselves to the Knowledge alone. One is the outcome of the knowledge, and another is the outcome of the ignorance. So have we heard from the wise. S/he who knows That as both in one, the Knowledge and the Ignorance, by the Ignorance crosses beyond death and by the Knowledge enjoys Immortality. I would love to hear what it means to you. Does this passage (and Sri Aurobindo’s commentary) make any sense to you? What do the ideas of multiplicity and unity mean to you? How could these concepts help you to understand yourself? Situations in your life? The world? God? Are there opposites in your life that you’re fighting against? What would it feel like to explore the possibility of needing both sides? How many “opposites” can you think of that are part of life? Please add your ideas in the comments below! Thanks for this, Summer! Your thoughts made me think of something I encountered in college. One of my professors at the Oregon Extension had worked quite a bit with the Internal Family Systems Model, which (if I don’t butcher this) sees consciousness as composed of discrete subpersonalities (“managers,” “exiles,” and “firefighters”), and it is only by accepting and even loving all of these parts, some of which are things we may see as negative/bad parts of ourselves, that we can come to be our true selves and reach a healing wholeness. This is a model that’s provided me some interesting fodder for thought. Thank you so much for this insightful response Alissa! The tension between faith and doubt has been a huge part of all my exploration and study. I truly believe that it’s this tension that has brought me to where I am at this point in my life. I’m grateful for it. And I think that it’s a dynamic that will be of use (and blessing) to you and all you serve as your role as an ordained minister. I can remember when about 10 years ago an older man in our faith community told me in response to my relentless questioning, “Sarah you may not believe this now, but a time will come when you won’t need to continue asking the questions.” He was right. I came, in my mid-70s, to know that some of my questions had no answers in this life, and that I really didn’t need to know in order to be whole and surrendered to God (abandoned to Divine Providence). I realized that notions of struggle and/or searching for answers were irrelevant once I understood that I already had within me all the knowledge I needed in order to receive and act upon the wisdom that had been here all along and that which was yet to come, especially as I learned to sit in stillness, receptive silence and to simply listen. Jesus isn’t the only one to teach that what we seek is within us already; this knowledge alone has been known throughout time. It’s a beautiful journey to just rest in the Lord of Life, Love of the Universe!